I don't even know if this is truly my top 12 of 2008. I'm just cruising through this year's posts, looking for items that really moved me, or that I thought tasted great. Sometimes I think I'm not even cooking as much as a food blogger should, to keep her credentials valid. Then I look back, and I'm amazed by some of the things I've prepared and eaten. Yeah, I'm proud. I think the bacon was my favourite one, I'm still plotting and planning to do that. WV - nomet - perfect! You have every reason to be proud. Just being you should make you proud enough. Happy New Year! Just wanted to wish you and Cranky a very Happy New Year and a kiss to Bean Sprout! 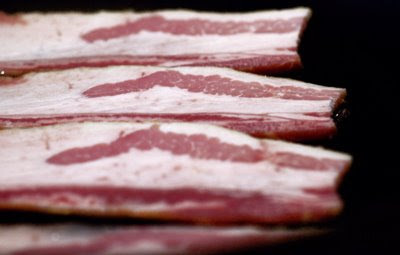 Morgan: It is so awesomely possible to make your own bacon. I find it easier than making bread. Sam: Aw! You are too kind. Happy New Year, dear friend. Nikki: Haw! I think I even like 'em more than bread. Chris: Thank you. I send equally loving good wishes to you and Embee. Happy New Year. The bacon was my favorite! I finally made my own maple cured bacon for NYE. It wasn't as smoky as I wanted it to be, but even bad bacon is pretty darn good. Happy New Year! Leena: I've been thinking about a bourbon-marinated bacon. Probably with maple. Doesn't that sound good?